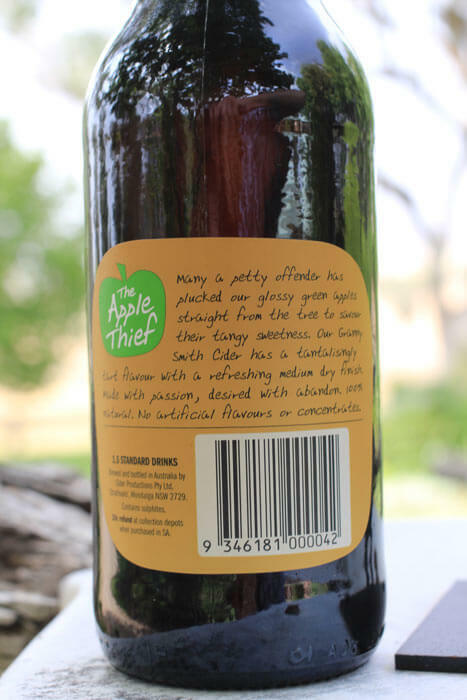 Apple Thief set themselves apart in the market by making ciders from single varieties of apples. The clue is in the name, Apple Thief Granny Smith Cider. David Purcell the owner and cider maker, grew up in the apple orchards of Batlow, New South Wales. He’s set himself a challenge making ciders without blending varieties instead it’s made exclusively from Granny Smiths. Single variety ciders are a rare thing. Normally there are only 2, maybe 3, species of apple that it can be done with, Kingston Black being the most well-known for this job. It can’t be done every year because the crop might not have that full flavor profile or sugar to make a good drink. It’s often said that the real art in cider making is the blending of the juices. Some apples are for sweetness some for acids, others for the tannins. To really nail a single variety cider every step in the fermentation must go to plan. The Apple Thief really has the odds stacked against them. No opportunity to blend juices and only using Granny Smiths, a non-traditional cider apple. Purely on a technical level on the science of fermentation this is a real hard way to make a balanced cider. Mulched grass is the main character here but it’s backed up by that familiar smell of cooked apples. Probably due to the Granny’s, which make great cookers. You guessed it, this tastes just like a Granny Smith, big, juicy and tart. Wow this is tart. There is a lot of what you would expect from the white flesh from a Granny. I was expecting more of the green grassy skin flavor out of this but that seems to be light on. Apple Thief has given their Granny Smith just enough sweetness to tame the tartness, but it’s the underdog in this power struggle. The golden cider has a generous fizz on the pour. That tartness hangs round in the finish leaving you with a clean palate. I’m thinking that this is an excellent black and white photo. The composition is well thought out and refreshing straightforward, uncluttered by complexity. Today was over 40c with a hot wind whipping up the dust. This ice cold acid hit washed it away nicely. The Apple Thief set themselves a challenge to find their gap in the market. This tart little Granny (Smith) does that. We really appreciate your review on our Apple Thief Granny Smith cider. We just popped into the lord raglan Jonathan said you drop in quite a bit. Would love to meet you at the pub for a cider we could chat about our pink lady which won best in class at the cider awards! Might be good timing as we got some new season fresh apples from the farm at Batlow! Look forward to meeting a fellow cider lover!